Today was amazing. We started our morning off at the transition home where we took photos for families who are waiting to meet their kids. We loved getting photos while we were waiting and it was exciting to get to send a little bit of that excitement to other families. As we entered the gates of the Transition Home, the kids waved and shouted with excitement. When our daughter saw us in the van, she jumped up and down with her arms in the air and her face lit up with an excitement that we will always remember. Soon after our arrival, she swiped Brad’s phone out of his pocket and ran all over the place taking pictures of friends, nannies, and her brothers. She followed Wesley around as his shadow for a long time copying everything he said and did. After our time at the transition home, we went to visit and orphanage. It was about an hour drive and we got to see a lot of great sights along the way. There were lots and lots of people and cars on the road all just sort of weaving around each other. The driving here is crazy, but all of the people are so kind and patient that even though horns are honking constantly, the drivers are all still calm and smiling. Sometimes, you swerve really, really, really close to other cars and even pedestrians, sometimes you drive on the left-hand shoulder, sometimes you swerve around a mule that is standing in the road to avoid flies in the grassy fields…whatever it takes. I am thankful we have an expert driver and despite the apparent chaos we feel very safe. The orphanage we visited is relatively new and there were about twenty kids there from infants up to ten years old. There was just something about it that was so joyful. It strikes me as odd that to be in place that exists because of sad and traumatic situations, we can walk into a mass of smiling faces and truly feel joy. The nannies played happily with the kids, a variation of duck duck goose. The kids sat nicely in their school desks and sang us a couple of songs. We returned the favor by singing Jesus Loves Me for them. The boys all played catch and soccer with the kids. Elliott and I wore watches with buttons that entertained a couple of girls for about 15 minutes. As a result, the alarm on my watch went off three times on the drive back. They gave us hugs and kisses and were so sweet to us. On the drive back Spencer said that he really liked going to the orphanage, but he liked that transition home a little bit better because his sister is there. The boys are loving all the time they have spent playing with the kids here. Wesley and Spencer have decided they want to move to Addis! 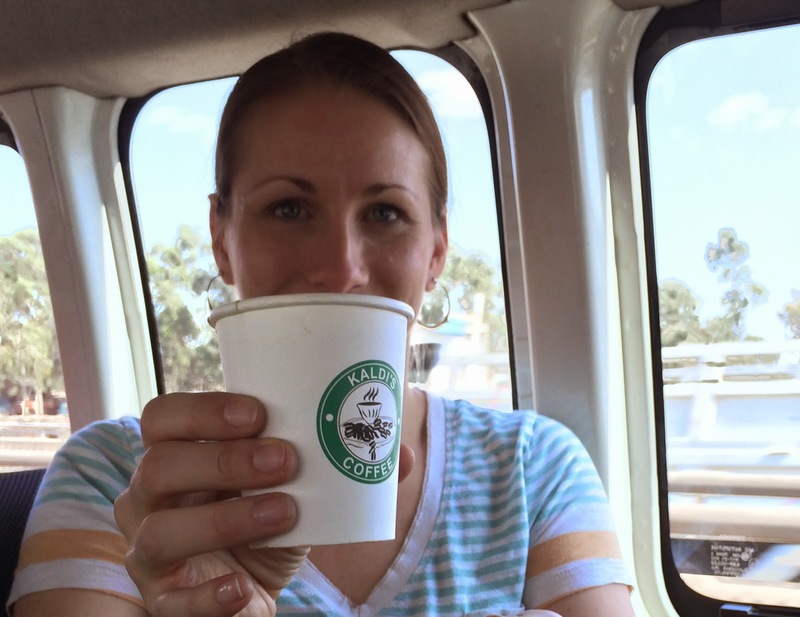 And to top it all off, I had my first Ethiopian macchiato here… it did not disappoint! Today was the day we had been envisioning since we got our referral 7 months ago. We finally got to meet our daughter! It was a flood of emotion that I am not sure I can put into words. There are many photos and videos of today, but they can’t be posted until our court date (this Thursday). After staying up last night until after 1:30, we were awakened at 5:30 by the call to prayer blaring from the mosque. We all spent the morning in nervous, excited anticipation. We didn’t know what to expect, or what to say, or how she would respond. We didn’t know how the boys would react or if we would overwhelm her, all five of us waiting to greet her. Our guide picked us up from the guesthouse and drove us to the transition home. We parked outside the gate and he went in to tell her that we were there. The super nice family we are travelling with offered to take photo and video for us. We lined up at the bottom of a staircase waiting for her to come outside. As we saw her come through the doorway, we each lit up with a huge grin, Brad and I added some tears of joy along with our smiles. She came right up and gave us each a big hug. She wrapped her arms so tightly around me and I didn’t want to let her go, but Brad and the boys needed their hugs too! After the hugging and the tears we sat down and showed her pictures on our phone. This girls LOVES pictures, she loves looking at photos, taking photos, posing for photos…and she certainly knows her way around an iPhone to do all these things. (The selfie trend has made its way to Ethiopia!) Before we left home, Brad walked through our house to make a video for Lielti. She must have watched it a dozen times today. I wish I could explain the way her face lit up when we got to the part of the video that showed her room. After we sifted through photos we took out some markers and colored for a while. It wasn’t long before we had a crowd of excited kids joining in. We colored with the kids and got lots of hugs and even some kisses. The boys jumped right in and played soccer and football. They had a great time and made fast friends with the kids there. Turns out our girl has a great arm and can catch a football too! We spent the afternoon playing and marveling at the fact that this adorable little girls was calling us mom and dad, right here with us…finally. We toured the transition home and she proudly showed us her room. We met nannies and the cook and visited the babies. I cannot possibly do justice to the feeling of being here with my words. To spend the day with our daughter and her friends, to meet the people who do such a great job at the transition home, whether it be our guide, the cook, the nannies, the director, the teacher, they are all such great people. It has been a joyful, exhausting day. Not completely sure what day it is. We woke up at 5:20 Sunday morning to get ready to leave. The boys woke up shortly after wide awake for some adventure. Left Wenatchee at 6:50 and drove over the clear pass to the Smiths house in Redmond where we were able to chat with Carol for a few minutes before she gave up her morning and dropped us off at the airport with our 15 items of luggage (mostly containing donations of one form or another). We waited around the airport for a few hours until we boarded our Lufthansa flight to Germany. Adventure you say? Not yet. 10 hours on the plane with electronics galore. Very little sleeping occurred. Heavy jet lag is definitely in the forecast. The boys were happy and patient on their first flight, however they weren't impressed with the airplane food options. Spencer was the only one who accomplished a deep sleep - about 20 minutes before we landed. Lindsey had to rudely interrupt Spencer's sleep and we disembarked in Frankfurt with only 10 minutes before our next flight boarded. We had hoped to have an hour to stretch and refresh but that didn't happen. The nerves were starting to unravel. Fortunately as we boarded our next 9.5 hour flight, the nerves went back onto the spool and everyone kept it together. While the electronics weren't as high tech on the second airplane, it didn't take as much to entertain a family of zombies. Once we flew past the alps (I think) it cleared up and we could see Croatia and the Adriatic Sea below. The airspace above Greece was a little slippery and the boys got to experience a bit of turbulence, but that didn't phase them. Elliott just grinned when his stomach seemed to jump up in his throat. Shortly after flying over the Mediterranean, we all got a few hours of sleep on the plane. Pit stop in Saudi Arabia and off to Ethiopia! Getting through visas and baggage claim seemed a little like aimless wandering for a bit, especially with five of us. We were held as a captive audience in the visa line for a boisterous Nigerian man who kept being surprised by the fact that us Americans were adopting a girl with dark skin because he had many accusations about Westerners been racist. He also called Lindsey beautiful several times and told our kids to be bold stand strong like an African man. Not sure what was going on, but we have a way of attracting the loud people... probably because we looked quiet as we were trying to figure out what we were doing. We finally made it to the guest house around 11:00 PM Ethiopia time. Chatted with the other couple in the guest house who got to meet their son earlier today. Will be fun to get to know them more this week. We now need to go to bed so we can meet our daughter in the morning and make a day that we will remember forever! It's Saturday night and all the suitcases were packed and double checked well before the Seahawks game started. Once the victory was celebrated, the bags were triple checked and the boys made sure they had everything they needed to keep them entertained for 20 hours of flight. After a week of scrambling and preparation, now the house is quiet. This seemed like a good time to type my first blog post in over two and a half years. We wait (and possibly sleep a little) before we have to get up early in the morning, drive to Redmond, and have my sister drop us off at the airport. It's finally starting to sink in that we are headed to Ethiopia tomorrow. To meet our daughter. We have seen her face, prayed about her by name, and anticipated this trip for 7 months. Now I can only think about what her reaction will be when she finally meets us. We have heard how excited she is to meet us, but have to wonder how she will feel about it when she actually sees us. Will it sink in that in a month from now she will have to leave everything she knows, everyone she knows, and the culture she knows to live with people she doesn't know? I'd be frightened. We have been praying for God to prepare her heart as well as ours. The boys are excited and nervous for their first flight. We talk about how fast the airplane goes before it can take off, the fact that we will touch down in three new continents, and how our sleeping schedule will be all messed up. Hopefully everything goes as planned. We know we have a lot of family and friends praying for us. We have been so blessed and encouraged through this process it is overwhelming. Soon we will have pictures to post and more interesting stories to tell.